Find inspiration for your winter wedding with these trendsetting winter wedding centerpiece ideas. Whether your wedding style is classic chic, hopelessly romantic, or uber modern, we've put together some of our favorite winter wedding centerpiece ideas that are sure to get your ideas flowing. Featuring a collection of our favorite winter wedding centerpieces gathered from the Pinterest community including everything from sparkling crystal trees to rustic pine cone displays. If you're not already doing so, also be sure to follow our wedding boards on Pinterest to see other great wedding ideas, tips, and how-tos. When it comes to your table centerpieces, take your time deciding on the perfect arrangement. Your centerpieces are one of the first things your guests will see when they enter your wedding reception. They will help set the overall tone of your reception and help give that important first impression. After all, it's every brides dream to have guests gushing over the beautiful wedding details they've spent countless months planning and preparing. Your wedding centerpieces will go a long way in making that dream become reality. For traditional brides, classic details are a must. Think snowflake decor, glitter, and a soft candlelight glow. For traditional winter brides, you can't go wrong with candle centerpieces. To add visual interest, consider incorporating candles of different heights. Smaller votives filled with monochromatic flower buds will add texture and will soften the table. Lastly, add glittery snowflake table scatter to the tables and a few ornaments to reflect light. 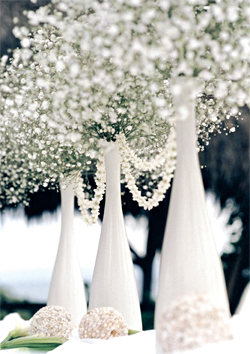 For a show stopping display, consider placing taller white vases filled entirely with baby's breath on a few tables. This unique take on classic winter centerpieces will mimic the look of snow and capture your winter theme. For your winter wedding color palette, all whites and creams with accents of silver and gold will look super chic. Other color palettes to consider are blue and white or blue and silver. When creating a romantic table setting, it's all in the lavish and elegant details. Think sparkling crystals, extravagant chandeliers, and lush flowers. For today's romantic winter bride, we love the idea of using bare tree branches strung with crystal. Leave the branches all naturel or spray paint them in silver or white to continue and icy winter theme. To add dimension to the tables, be sure to add candlelight to catch the light in the crystals. Add in floral arrangements to complete the look. If you are not one for the bare branch look but still want a romantic setting, flowers are the perfect way to create a look that oozes romance. A classic wedding staple, flowers can be styled to fit any theme or vision you have in mind. Be sure to consult your florist about the look you are going for. Your florist will be able to suggest a number of different flowers that can be combined to give texture to your tables while still maintaining a cohesive look. If you are looking to save money and still would like to have a lavish floral centerpiece, opt for silk flowers instead. Silk flowers will save you money and can be put together in advance, saving you time. 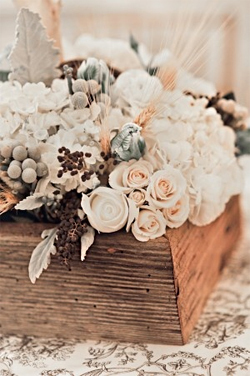 For those with a country or woodland aesthetic, give your centerpieces a rustic touch to lend to your earthy style. Wooden details, bark accents, and earthy color schemes are ideal for rustic looks. Incorporating items like pine cones and pine trees into your decor will help keep your winter theme from looking too fall. Consider items like bare tree branches placed lengthwise across each table or placed in tall cylinders filled with pinecones. Wooden planter boxes filled with berries, lambs ear, and other winter florals will create that right amount of rustic style while still creating a winter theme. Birch trees are also a great way to lend a rustic touch and keep a white winter color palette. For today's bride looking for a modern take on a winter wedding, simple is better. 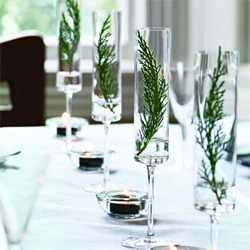 We love the idea of simple crystal glasses filled with single evergreen springs (shown right). One simple touch can easily say winter. 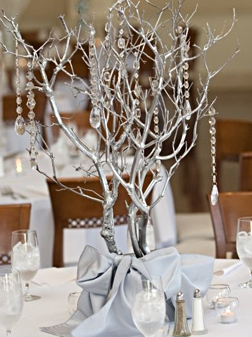 Another great option is bare tree branches accented with icy crystals for a modern look that still says winter. When going for a modern look for your centerpieces, be sure to also take details like your color palette into consideration. If you are having all white monochromatic color scheme, add a single bold pop of color into your table centerpieces for visual interest. When choosing a modern winter table centerpiece, don't be afraid to play with shapes. Square vases, tall arrangements, or opaque ceramic holders will look great and modern. Keep your look cohesive by choosing a single arrangement for your table and repeating the look across your reception venue. For more winter wedding ideas and inspiration, follow our wedding boards on Pinterest.